So, this is a huge topic. For such a small room, communal laundry rooms are a major source of income for a lot of our less honest community members. They are also a major source of expense for many of our building owners. And it’s getting worse. There are a few ways to address this issue. As we go through some of them, remember that the more security you add, the less convenient your building becomes. You will have to decide how far you are willing to go to put an end to the madness occurring in your laundromat. Always locked from the outside, never locked from the inside. This means tenants will always need a key to get in the door. Anyone without a key cannot enter without physically breaking in. Ideally this would be the only measure you need. It is, however, only a mechanical lock and can still be pried or picked, and still relies on the strength of the door and frame. At the rate laundry rooms are being broken into right now, I’m not sure this is the solution you should end with. This is the next step. Whether you use the deadbolt or lever version of these types of locks, the key is that no one but you needs a key. These locks can hold up to 25 codes, even without a connected hub, allowing you to either distribute a code to each of your tenants or use a single shared code to everyone. Many of these locks, including the one pictured above, can be programmed to lock behind you. 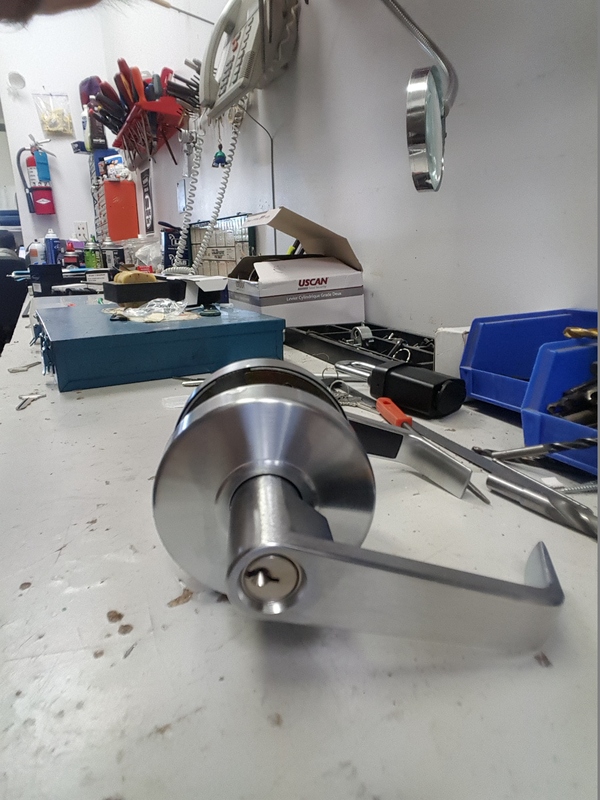 In the case of the Yale, your re-lock happens after 30 seconds, 1 minute, 2 minutes or 3 minutes. This is the solution I would use, but I would use it in tandem with the next solution. This, to many, will seem excessive. I don’t think so. To make this effective, you must have set times that the laundry room is considered accessible. During these times, the alarm system is disarmed allowing anyone who has access to use their key to enter the room. Most current alarm systems have an internal clock that allows you to set arming and disarming schedules. Thus, if you want to allow traffic through the laundry between 6 am and 10 pm, you can program the alarm to arm at 10 pm everyday, and disarm at 6 am everyday. Obviously, anyone who tries to enter between 10 pm and 6 am will be caught as soon as the door opens. If you’ve ever heard an alarm siren in a home you know how loud it is. Imagine the same siren mounted somewhere in an apartment building. Everyone is going to know the door was opened after hours, and anyone who wants to can get the police on their way. Yes, it can be monitored. Yes, an alarm in this capacity is effective. Often more so than a home system. Put the same alarm system in the laundry room, with the electronic lock on the door, and you can do many more things. The alarm will work like the alarm, arming at 10 pm and disarming at 6 am. Simple. When you bind an electronic lock to a hub like this one you also add more capacity for codes, the ability to create scenes, and DIY monitoring to your mobile phone or computer. The electronic lock will then be programmed to disable it’s keypad between the same hours. A deadbolt can use “privacy mode”, which stops a code from being used between certain hours. Privacy mode can only be turned off manually by someone with a key. Anyone with a key will also have a code for the alarm. I would assume that these would be individuals you trust not to destroy your machines for a few bucks. Privacy mode is usually reserved for bathrooms, bedrooms and/or offices. Keeping a room locked for certain hours is just as legitimate a use. 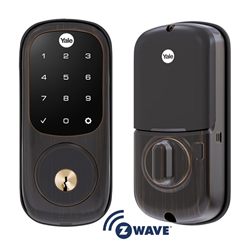 This system will do everything your automated alarm will do, but instead of using an electronic deadbolt or lever, it uses a strike and card reader. This is the most secure way to control access to your laundry space. All of your tenants will need card to get in. When a tenant leaves and doesn’t return the card, you disable it. When a new tenant moves in, you enable their card. Card Access systems can be done in both monitored and non-monitored formats. The vast majority have on-board schedules for door lock/unlock times as well as audit trailing for time logs on the last cards used to unlock the door. 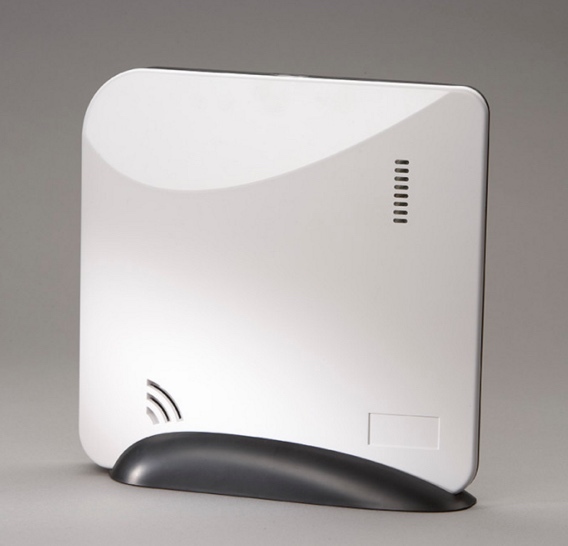 They can perform as alarms as well, provided the right equipment is used. Keep in mind that if you do it this way, you have the option of expanding the system to the front/back door of the building as well. As long as we keep the manufacturer or your readers the same, the entrance card can double as the laundry card. This biggest misconception regarding cameras is that they are designed to catch people. They aren’t. Surveillance is designed to show you what was happening at the moment the system was recording. They give you a better chance of recognising the person, but mostly they are going to show you how things happened. Faces are easy to hide. That said, cameras that are installed in the right locations are great deterrents and see all movement all day long, whether an alarm is armed or not. This is your 24/7 protection and tracking. None of these solutions is expensive compared to the damage we’ve witnessed in some of our local buildings. Some of those clients have had 3, 4 or 5 break-ins and need it to stop. It’s time to stop it. TbvI8p Say, you got a nice blog article.Thanks Again. Awesome.